Roxbury Park, one of the newest public spaces in the ACE Basin, provides visitors with easy access to a wide variety of wildlife species. 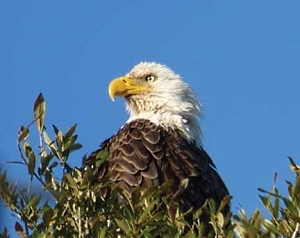 I knew the day was off to a good start when, not long after leaving the parking lot, we saw a pair of bald eagles within kissing distance of one another in the top of a large live oak that sits right next to the cottage. This particular beautiful September morning found me on a bird walk at Roxbury Park in Charleston County, along with fifteen other birders from the Carolina Bird Club. 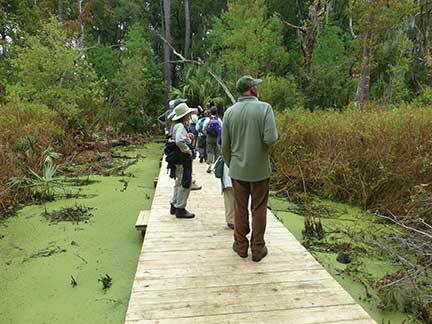 The CBC, as it is affectionately known, was having its annual fall meeting in Charleston, and Roxbury was one of more than a dozen birding hot spots in the Charleston area to select from for field trips. Roxbury Park, owned and managed by the nearby Town of Meggett, is one of the latest pearls in the string of publicly accessible jewels in the 350,000-acre ACE Basin Focus Area. 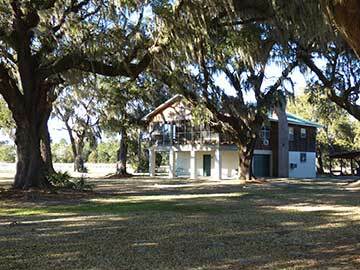 It joins a long list of protected public and private properties that make up this extraordinary area, properties that include the ACE Basin National Wildlife Refuge, Donnelley Wildlife Management Area, Bear Island WMA, Hunting Island State Park, Edisto Beach State Park and Botany Bay Heritage Preserve and WMA, one of the most popular Department of Natural Resource properties in the state. Two other nearby natural areas, Caw Caw Interpretive Center and the DNR's Dungannon Heritage Preserve, lie just outside of the ACE's boundaries. 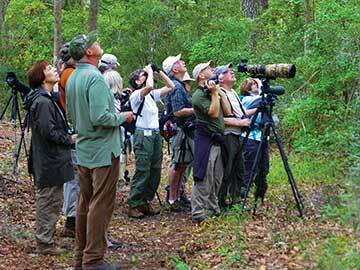 Our trip leader this morning was Cherrie Snead, a local resident who knows the area and its birds. We were also joined by the park's resident naturalist, Ken Carman, who is quite knowledgeable about all aspects of its flora and fauna. We started our walking loop near the northern end of the 157-acre park, which is bounded by Highway 174 (on the way to Edisto) to the west, Little Britton Road to the south and Toogoodoo Creek to the north. 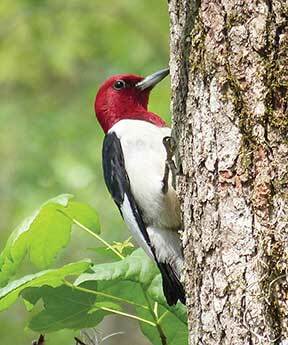 At the parking lot, tall, scattered loblolly pines provided habitat for everyone's favorite woodpecker, the striking red-headed. And shortly after seeing the bald eagles, we observed flying over the brackish pond one of the more uncommon raptor species of the Carolinas, a merlin, a species which has always reminded me of a kestrel on steroids. As we walked north along the pond's edge we flushed from roadside thickets and shrubbery an assortment of warblers, wrens and sparrows. Up ahead, perched on a bare-limbed dead live oak, were seven wood storks. We were now on the spacious grounds of an attractive two-story cottage, with two bedrooms and two baths, that is available for rent to the public, by the week or weekend and for special events. The cottage overlooks the broad marshes and waters of Toogoodoo Creek, one of the more colorful-sounding Lowcountry landmarks, especially when uttered by long-time locals. Feeding stations of white millet have been established near the cottage to attract North America's "rainbow bird," the painted bunting. Roxbury is in the heart of this beautiful bird's range, and the park attracts a number of them between April and October. From the cottage and grounds we turned south, skirting the eastern edge of the brackish pond and soon arrived at an interesting trail that runs down a long, high peninsula bisecting a large freshwater pond. The narrow, elevated peninsula, created by the previous owners during construction of the pond years ago, provides really nice views of both the east and west sides of the pond. The pond itself, covered with a thick layer of duckweed, was a complete freshwater ecosystem that started with a marshy rim of water willow (Decodon) and other emergent vegetation which merged into buttonbush and other shrubs, followed by ranks of red maple, black willow and other water tolerant tree species. There were plenty of dead and dying trees dispersed throughout to provide ample perch sites for wading birds and lots of potential food for woodpeckers. The pond, with its abundant food and cover, is ideal habitat for waterfowl, rails and bittern, a fact not lost on Ken Carman, who reported seven broods of wood ducks raised here last summer, without the benefit of a single nest box. 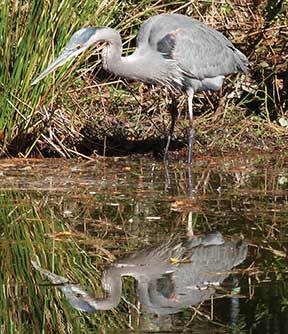 In addition to its abundant bird life, the pond shelters alligators, otters, minks and raccoons. The various shades of greenery at the pond's edge were quite attractive this time of year, with the red maples just starting to provide a hint of fall color. At the south end of the peninsula we crossed over the pond on a just-finished bridge and entered a mature coastal hardwood forest, one of the finest examples I've seen anywhere in the Lowcountry. 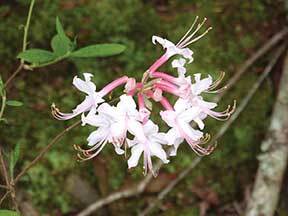 It featured many large specimens of pignut and mockernut hickory, cherrybark oaks with buttresses more than three feet across, magnolia, live oak, laurel oak, sweetgum, post oak, water oak, southern red oak and even a few American beech. Scattered throughout was the always interesting spruce, or Walter's pine, with its very un-pine-like bark. This beautiful forest is growing on a natural sand ridge about twenty feet above mean sea level, which is saying something for being only fifteen miles from the beach. We turned eastward, crossed over a low boardwalk through a bottomland hardwood wetland that fed into the freshwater lake, and explored a mature loblolly pine forest mixed with large water oaks, live oaks and laurel oaks. Here we picked up a black-throated blue warbler, Northern parula, American redstart, more pine warblers and a white-breasted nuthatch. As we made our way back to the parking lot we skirted along the edge of yet another habitat type that contributes more diversity to this remarkable property, a large hayfield. Carman has plans to convert some of the field to butterfly gardens and is also in the process of constructing a 2,000-foot muscadine grape arbor to provide a shaded walking path for warm weather. He has also erected various natural-appearing perches around the field to better observe the twenty-two species of dragonflies that have so far been found at the park. More than twenty species of birds have used these perches too, including four raptor species, summer tanager, blue grosbeak and sedge wren. We arrived back at the parking lot three and a half hours after we started with a respectable bird list of fifty-nine species. 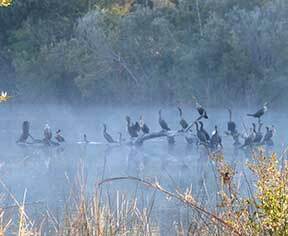 Carman reported that currently 155 bird species have been seen at the park, an impressive number for a property this size, and no doubt this figure will climb steadily as more and more birders and naturalists discover this convenient, accessible and diverse Lowcountry jewel. Roxbury Park has a history that, like many parks and natural areas, could have gone the other way. Developers had their eyes on the land, but thanks to the vision of the Meggett Town Council and Greenbelt funds from Charleston County's Transportation Sales Tax, the property was spared and first opened for public enjoyment in November 2013. 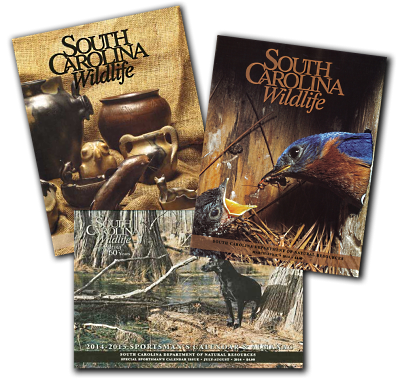 It provides a great introduction to the birds, wildlife and natural features of the Carolina Lowcountry, and no doubt long-time residents and experienced naturalists will find plenty to enjoy and appreciate as well. For more information, visit the park's website at http://townofmeggettsc.org/roxbury-park/. Another online resource, regular postings to the park's Facebook page, give a clear picture of what you can expect to see in the park throughout the year. Roxbury Park is open from 8 a.m. until 6 p.m. on Saturday and Sunday, and is closed during the week except by special appointment. Admission is free. Self-guided walks are encouraged, but private guided walks can be arranged for a fee. In addition to birding, hiking and natural history observation, the park has catch and release fishing, a canoe/kayak launch and bicycling paths. A reservable picnic shelter is available as well. Coming from Highway 17, the park entrance is located on the east side of Highway 174 just past the Toogoodoo Creek Bridge. 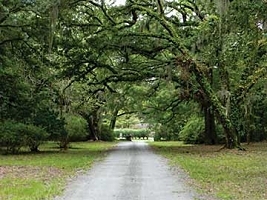 The entrance drive is classic Lowcountry, consisting of a venerable live oak avenue dripping with Spanish moss and with under plantings of Indica azaleas. 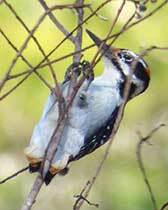 Retired DNR wildlife biologist John Cely is a frequent contributor to SCW.